Once celebrated for the religious background, Easter is now celebrated in countries far and wide, whether for religious reasons or seasonal reasons. Myself and Spud celebrate for both religious and seasonal reasons, and I must admit the Easter bunny plays a big part of our annual Easter celebration, along with quality family time with our wider family. 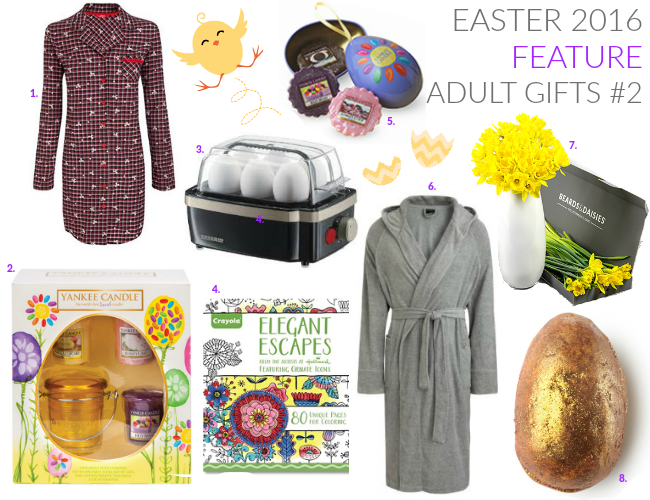 This year, I'm featuring a great range of products for Easter, including traditional Easter eggs, along with alternative sweet treats, and alternative non food gifts - for the whole family, no matter the recipient's age! I'm also featuring arts and crafts based items, along with decorations and more! I hope you enjoy, and whatever you do this Easter, I hope you have a eggtastic time! If you're looking for the perfect gift for a man or whisky fan, then look no further, this Elizabeth Shaw's Famous Names, Whisky Collection Egg includes eight of the finest liqueur chocolates from world famous whisky brands including Teachers, Grants and Drambuie. It's the perfect gift for those who enjoy a little tipple or two. 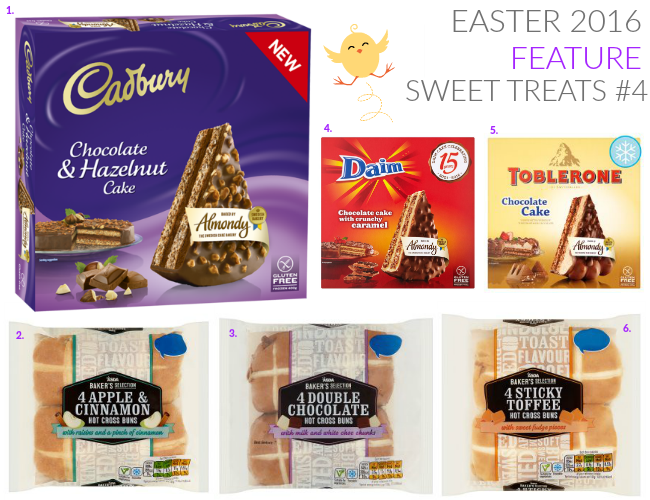 As ever, the Cadbury Easter range is one of the largest seasonal ranges around, with six new products recently launched in time for Easter, you're a sure to find an egg for everyone's taste buds this year! Prices start from just 60p for a miniature tube of their famous Mini Eggs, going up to a reasonable £9.99 for a giant egg. These curiously moreish range of scrummy Monty Bojangles Truffle Eggs are available in four varieties. Choose from either Flutter Scotch, Berry Bubbly, Scrumple Nutty or Choccy Scoffy. Each Belgian milk egg contains a delicious hollow truffle chocolate egg, which comes in a lovely decorated box, accompanied by Cocoa Dusted Truffles of your chosen flavour! Sold in Tesco, Waitrose and online. 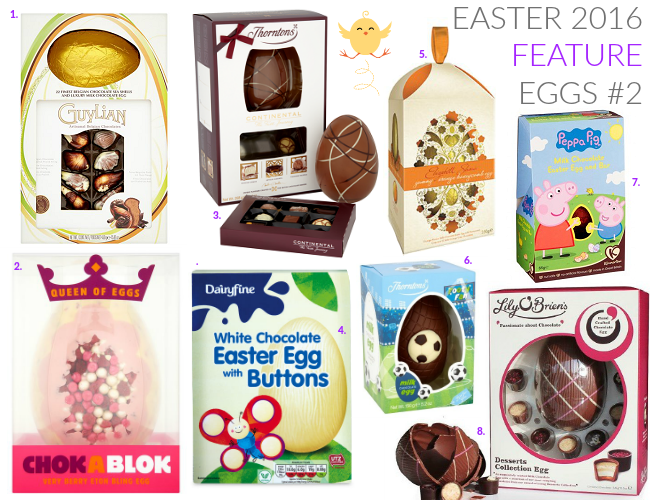 Thorntons have so many cracking Easter eggs, you'll be spoilt for choice this Easter! Harry Hopalot is Thorntons very own Easter bunny, and along with bringing you fantastic products featuring himself in both white and milk chocolate, he's also bringing lots of other eggs to our rescue! What's more, Harry is just one of a number of eggs on a deal of 5 for £15! Choose from a wide selection in store and online! Nearly all children (and adults!) love the adorable Millions from the much loved Despicable Me movie, so why not get your Minion mad fan this egg for Easter? This real milk chocolate hollow egg comes with strawberry flavoured candy coated marshmallows, weighing in at 70g for just 100 pennies! What's more, this is just one of the few character egg ranges on sale this year! Wow your nearest and dearest with Asda's show-stopping Extra Special Belgian Milk Chocolate Golden Egg with Milk Chocolate Truffles this Easter. This deliciously creamy chocolate has been dressed in a coating of metallic gold lustre dust to give Easter celebrations that extra sparkle! If they've asked for gold this Easter, give them the gold they'll love! Made from cocoa beans produced on small farms in the Caribbean Sea, Black Chocolate Grand Cru Carribbean has a slightly sweet taste and a soft fragrance of dried fruit. The flavour begins with a gentle acidity, which fades to make room for chocolate mingled with the aromas of roasting. Coming with a more expensive price tag, it's one of the luxury buys, but will leave mouth watering sensations in the mouth! This cupcake Easter egg is the perfect Easter egg for anyone who loves cupcakes, or who likes baking! Made of deliciously smooth Thorntons milk chocolate, decorated with a white and pink coloured chocolate cupcake! This is just one of the £4 eggs Thorntons have on offer this year, with deals to suit anyone's budget without breaking the bank! This irresistible chocolate egg set comes complete with a full-sized box of Guylian's classic praline Sea Shell chocolates in an egg-ceptional box. The perfect treat to gift friends or family this Easter time! Inspired by a classic dessert, this egg-ceptional dazzling thick egg is perfect for the fruity Eton mess lover of the family. The thick, creamy Belgian white chocolate giant shell is bursting with sweet freeze dried strawberries, whilst coated with white chocolate coated malt balls, crunchy pink meringues and fruity raspberry pieces, all dressed with a raspberry flavour pink swirl. Discover a taste journey with this Thorntons Continental Gift egg, inspired by the taste of the continent, this delicious milk chocolate egg with statement design forms part of Thorntons Luxury Easter Eggs collection. This hollow egg comes with an assortment of seven milk, white and dark chocolates from the Thorntons Continental Collection, including exciting new chocolates such as salted caramel praline, seville caramel, and their classics like the Swiss ALps and the Viennese truffles - my personal favourite! This tasty white chocolate Easter egg comes complete with white chocolate buttons, and is a fab steal for under £1! White chocolate products are more harder to come by when it comes to seasonal events, so it's great to see as well as milk chocolate egg with buttons, Dairyfine also do a white chocolate egg! This is one deliciously crunchy orange flavour milk chocolate shell egg, with melt in the mouth honeycomb crisp pieces making it the perfect egg for any Elizabeth Shaw fan. Wrapped in a beautifully designed gift box which included 12 milk chocolate orange crisp chocolates, and a uniquely decorative ribbon handle! Also available in Dark Mint Chocolate. If you have any football fans in your household, then this fantastic football egg is the perfect Easter egg for them this year! This 150g hollow milk chocolate egg, is decorated with a milk, white and dark chocolate football decoration - a goal net pattern along with a football that has been hand-finished, it's the small touches that make Thorntons eggs extra special. Also part of the 5 for £15 deal! This Peppa Pig milk chocolate hollow Easter egg is a great buy for any Peppa Pig fans this Easter! The egg comes with a chocolate bar, is nut free and has no artificial flavours, all for an affordable £1! Just one of the many eggs available at Poundland this year. An exquisitely crafted milk chocolate egg with a selection of nine Lily O'Brien's most tempting chocolates from their award winning Desserts Collection! If you're a Ferrero Rocher fan, or know a Ferrero Rocher fan, then this bag of 10 individually foiled wrapped mini mouth-water Ferrero Rocher eggs are the perfect self buy, or alternative egg treat this Easter. Filled with a creamy heart of cocoa, and enveloped in a crispy wafer and smooth, irresistible chocolate. Created exclusively for Pierre Hermé Paris, this milk chocolate rabbit is made with 45% cocoa - a relatively high percentage for milk chocolate! It's pronounced cocoa flavour lingers on the palate, thanks to the milky notes and the slight taste of caramel. Presented with a orange ribbon bow, it's an expensive buy, but truly worth it. These milk chocolate Eggjoyables from Aldi are just one of the two varieties of Eggjoyables sold. Presented in a cute four carton style egg box, you'll find four milk chocolate mousse eggs with two spoons, making them the perfect sharing eggs this Easter. 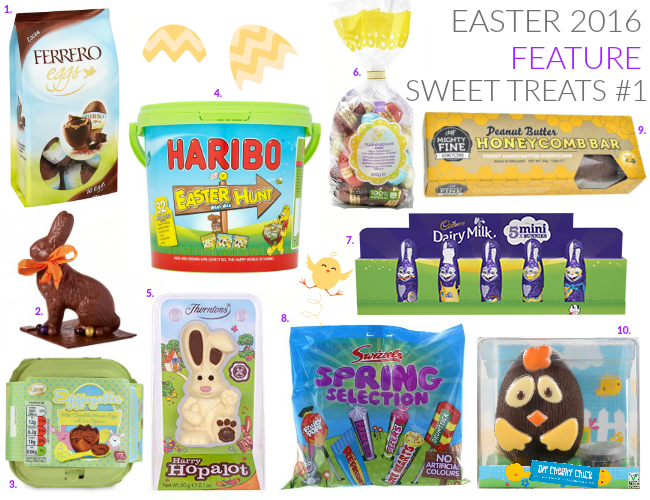 This Easter themed bucket features 32 mini bags of the much loved HARIBO variety, plus some extra goodies including Easter hunting tips, clue cards and stickers! Great to hide around the garden and inside the house, or to give out at any Easter parties! The bucket is also super handy to keep year after year! Thornton's very own Easter Bunny Harry Hopalot is making his second appearance in the UYM 2016 Easter Feature! This time, it's the 60g white chocolate Harry Hopalot model, made of milky white chocolate, with milk, pink and dark chocolate features, it'll be sure to bring a smile to any face this Easter! If you're into flavoured chocolate, then these miniature mix of individually wrapped eggs will be sure to please! With a mixture of butterscotch, caramel, chocolate mousse and milk crispy, it's down to you whether you share or not! Perfect for a treat to yourself, or as part of an egg hunt! Hopping into action for the first time in 2016, is the Cadbury Dairy Milk Hollow Bunny, they taste as sweet as they look! One look at these playful and infectious smiles will get you truly in the mood for Easter. I'm featuring the pack of five, as they're perfect for treats to indulge on, or be hunted for as part of a hunt! Also available in a range of sizes from medium to large, and single treats. Ideal for Easter hunts and parties, this 170g bag contains just some of the nation's favourite Swizzels Matlow lines including Fruity Pops lollipops, Drumsticks lollipops, Refreshers, Parma Violets, Fizzers and Love Hearts, all with no artificial colours! Mighty Fine's range of flavoured honeycomb bars are the ideal sweet treat with a difference! Not everyone likes Easter eggs, so why not treat them to something different instead of missing them out? This delicious honeycomb bar is fully enrobed in crunchy, peanut butter flavoured milk chocolate! It's 50g of pure Might Fine luxury to enjoy this Easter! Children can create their very own Easter masterpiece with Asda's DIY Chick Egg, simply melt the chocolate drops, and let your little Easter fans turn themselves into an artist! Its a fun challenge, and one that's edible too! Giving mum and dad time to get the roast sorted, or a easier option for pudding! This tasty milk chocolate bunny will make a great prize for an Easter egg hunt, or alternatively it would be great as a gift for Easter! For just 69p you really can't go wrong! These truffles aren't just an Easter buy, but they're so amazing, and come decorated like eggs that I had to include them! They come in three different varieties: Milk chocolate, Dark chocolate and Marc De Champagne! They're currently on offer for £1.49 down from £1.89, everyone loves a bargain! For a fun alternative to eggs, treat the little ones to Asda's loveable chocolate chick! Made from tasty hollow white chocolate, this cute 150g chick is great for white chocolate fans this Easter! Just like the Swizzels Spring Selection bag featured above, this tub contains some of the nation's favourite Swizzels Matlow lines including Fruity Pops lollipops, Drumsticks lollipops, Refreshers, Parma Violets, Fizzers and Love Hearts, all with no artificial colours! It's great for an Easter hunt or any Easter parties being thrown! Everybody loves pizza, and everybody loves chocolate! So why not treat the family to a joint Easter present and buy this fantastic 7-12 inch pizza? Just like a normal pizza, you're spoilt for choice in selection, whilst you may not be getting a chicken new yorker, you can be opening a takeaway-style pizza box to one of these delicious pizza's: Jellybean Jumble, Honeycomb & Marshmallow, Heavenly Honeycomb, Fab Fusion, Delightfully Dark, Gone Nuts, Crunchy Munchy or Double Dark & Delicious. Here he is again, and I can't promise it'll be the last! Hop, skip and jump your way through Easter with the tastiest Easter bunny Harry Hopalot! This milk chocolate Harry Hopalot model is a great alternative to an egg, although he does feature on eggs too if you like that idea, and at just 60g, it won't be too heavy on the tummy! Containing a mix of white, milk and dark chocolate, it's sure to satisfy the most fussiest of chocolate eaters! He's also part of the 5 for £15 deal, so what are you waiting for!? Made with delicious milk chocolates, these mini bunnies, eggs and coins are ideal for a little Easter treat this year. 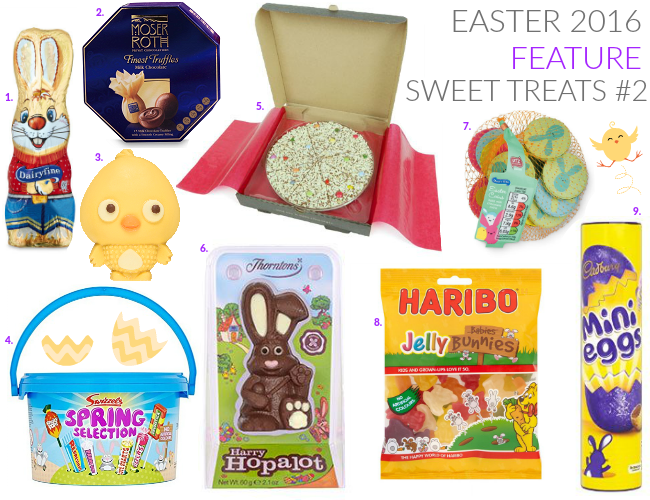 Whether you're doing a little bundle, giving out mini goody bags, having a party or organising an Easter hunt, then these are sure to go down a treat, for the recipients and for you thanks to their surprising price tag! For those that don't want to hunt for a treat this Easter, HARIBO has unveiled their Jelly Bunnies, a brand new treat especially for Easter! Bringing together jelly bunny shaped pieces with the popular texture found in their Jelly Babies, you'll be hopping mad to miss this tasty new addition! 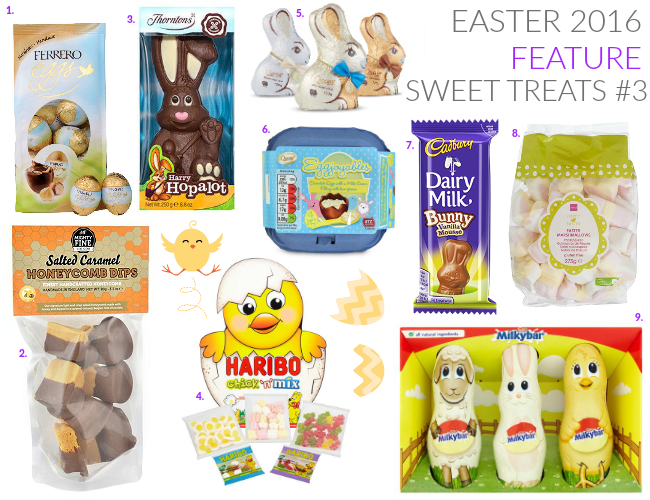 Available in two sharing size bags, or in a gifting box, it's an Easter treat that's perfect for one or more people! One of Cadbury's most treasured treats at Easter, Cadbury Mini Eggs are a crunchy bite of chocolate delight that keeps everyone happy! Whether you're a nibbler or simply love to snack, Cadbury's Mini Eggs are the perfect Easter treat for the whole family! With a whole range of sizes to choose from, there's something for an individual treat, down to a treat for the whole family! As I mentioned above, if you're a Ferrero Rocher fan, or know a Ferrero Rocher fan, then this bag of 10 individually foiled wrapped mini mouth-water Ferrero Rocher eggs are the perfect self buy, or alternative egg treat this Easter. Filled with a creamy heart of hazelnut, and enveloped in a crispy wafer and smooth, irresistible chocolate. Mighty Fine's signature, light and crisp, handmade honeycomb flavoured with sea salt and dipped into caramel-infused Belgian milk chocolate is the perfect alternative Easter gift for any honeycomb fans this Easter! What's more, it's made with only natural ingredients, is gluten free, comes in a resealable bag and Mighty Fine make a donation to the Friends of the Honey Bee campaign with every pack sold, what are you waiting for? Eat good, and help with a charitable donation! This sadly is the last time Harry Hopalot appears in the UYM Easter Feature, but it's been a blast having him involved! Giving and receiving Easter gifts is all part of the celebrations of Easter, so why not gift one of these 250g milk chocolate Harry Hopalot model, decorated with white, pink and dark chocolate features! Harry's holding a bag ready to give out his Easter love! This Harry model is currently on offer along with a whole range of other products - 5 for £20! It's no 'yolk' - why not give the gift of a tasty alternative to chocolate eggs this Easter? Or maybe you need to buy for someone who isn't a big chocolate fan? This HARIBO Chick 'n' Mix gift box set is new to the gifting range and features a selection of tasty jelly, foam and marshmallow treats! These cute sitting bunnies, come wrapped in foil and in three different chocolate varieties, choose from milk chocolate, dark chocolate and white chocolate! 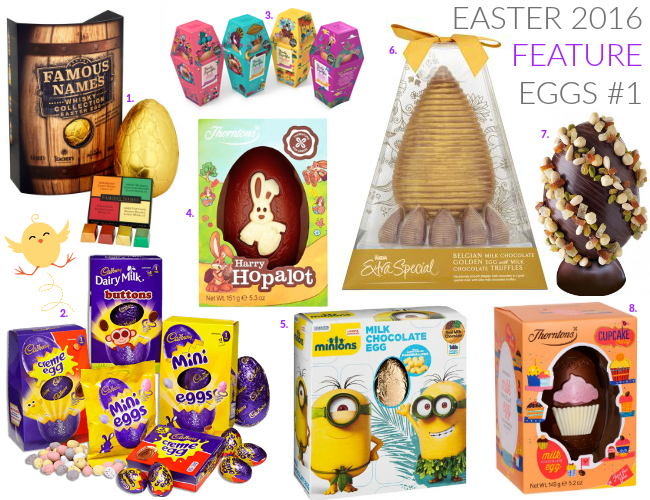 For under one pound, you can treat every type of chocolate fan this Easter! They also come with a cute little bow, colour depending on the chocolate type you buy! A little different to the milk chocolate Eggjoyables mentioned earlier, these ones are milk chocolate Eggjoyables filled with a milk cream filling. Presented in a cute four carton style egg box with two spoons, making them the perfect sharing eggs this Easter. The Cadbury Dairy Milk Bunny is filled with a delicious light and fluffy vanilla mousse that tantalises the taste buds with an abundance of flavour and texture. It's the perfect snack-ilicious treat to gift family members and it's sure to get everyone in a hopping mood in the lead up to Easter! These are a great gift for any non chocolate fans out there, or even to keep in the cupboard at home for the Easter treats and baking in store! They're also great for sharing between children (and adults too of course!) in any Easter games and hunts! They're made with natural colours and flavourings, and are also gluten free! What animals say Easter better than Lambs (sheep), chicks and bunnies!? With this Milkybar Easter Figure pack, you'll be spoilt for choice in choosing which cute foil wrapped chocolate animal shaped character to enjoy or give out first! Cadbury's chocolate and hazelnut cake with it's topping of crunchy hazelnuts coated in lashings of Cadbury's chocolate, makes one of the perfect Easter puddings this year! Cadbury's are the perfect pedigree, as makers of the first chooclate Easter eggs in the 1980s! Gluten free. If you're not keen on the traditional hot cross buns, then don't worry because Asda have a fab range out this year! This pack is apple and cinnamon, containing four apple and cinnamon hot cross buns with raisins! With milk and white chocolate chunks, these double chocolate hot cross buns will be sure to go down a treat with chocolate fans this year! I personally am not a fan of the usual hot cross buns, but do love chocolate so can't wait to give these a go! As well as the Cadbury cake above, there's also Almondy Daim, a mouth-watering combination of crunchy caramel pieces smothered in chocolate, or maybe you'd choose Almondy Toblerone, which features another classic combo of chewy honey nougat pieces wrapped in delicious milk chocolate. Gluten Free. Along with the two Almondy cakes mentioned above, there's also Almondy Almond Cake with Toblerone! Combing their irresistible almond base with rich chocolate cream, and smooth milk chocolate, you'll be tucking in to this delicious frozen cake in just 30 minutes (defrost time!)! On top, you'll find a generous layer of Toblerone pieces all covered with smooth milk chocolate. It's traditional to eat hot cross buns on Good Friday, and with the fabulous Asda range this year, I'm sure even the most least hot cross bun fans will enjoy one of their unique hot cross bun ranges! This pack has to be my favourite, with toffee fudge pieces, we're already onto our second pack in the UYM household! 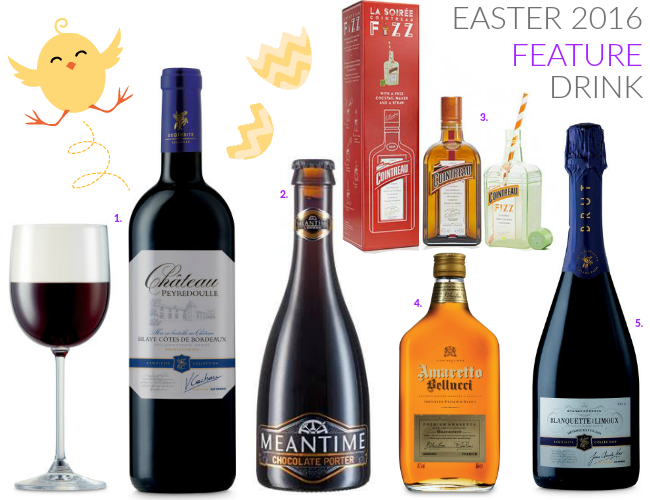 The new Exquisite Collection's Chateaux Series is a small collection of wine from across Bordeaux, meaning that you celebrate Easter in style, without breaking the bank. The Exquisite Collection Chateau Peyredoulle make a great match for tender roast without overpowering the meat's flavours. For an interesting twist on the traditional way of consuming chocolate this Easter, why not try this dark, warming brew which is Meantime's Chocolate Porter. Whilst a delight consumed on its own, this chocolate beer would go well with dark meats such as venison, a rib of beef or lamb shank. The new Cointreau Cocktail Maker is an absolute must-have for the warmer months and over the Easter period for any adult get togethers! By simply following the instructions on the side of the Cocktail Maker, you're able to make your very own Cointreau Fizz cocktails within minutes! It can also be drank straight from the cocktail maker with a straw which is super handy! Each pack contains a 200ml cocktail maker, a 500ml bottle of Cointreau and an individually wrapped straw! The delicate almond notes of Bellucci Amaretto are the perfect complement to creamy milk chocolate Easter eggs or puddings. Ideal poured over ice to make a mug of hot chocolate even more indulgent! Celebrate the start of spring with Blanquette de Limoux, the oldest style of sparkling wine in the world, dating back to 1544. This corker is made by Jean-Claude Mas - one of the most highly regarded winemakers in the Languedoc. Bitingly dry with delicate bubbles, apple and pear flavours, with a mouth watering finish. Traditional Burgundian winemaking meets the vibrant climate of New Zealand with Domaine Laporte’s Pinot Noir. This is a sensational balance of elegance and full-flavour that only Laporte is able to achieve.If you enjoy Nuit-Saint-Georges, you’ll love this! Almirez is made from 50 years-old average vines. These a low yielding vines producing a wine of concentration and character. The aging is 30% new French oak and 70% one-wine barrels. Uco Valley became one of the most well-known areas in Argentina winemaking. Red Wines from this region possess an intense, dark-red colour. The aromas are red-berry driven, with pronounced tannins and moderate intensity. Filus Malbec is the perfect incarnation of the Uco Valley wines. Bounce back from Easter indulgence with the uplifting Brazilian orange oil in this perky jelly and get ready to wobble your way to bright, juicy showers! Brazilian orange oil is brightening and toning on the skin and has a gorgeously sunny fragrance to help you wake up in the morning, while carrageenan extract is soft and gentle on your skin. Simply chill or freeze your jelly for a super-refreshing shower, or scoop straight out of the pot and smooth all over the body to work up a soft lather. If you've got to buy an Easter gift for a special male in your life, then consider a pair of Jockey pyjama bottoms! I received a female pyjama set for Mother's Day and they're the nicest pyjamas I've ever had! Quality, comfort and style all in one when it comes to Jockey clothing. How do you like your eggs in the morning? Toffee-scented, molten gold and packed full of Fair Trade Colombian cocoa butter? Soak in a dazzling bath of moisturising olive oil and golden lustre until your skin feels softer than caramel and smells more chocolatey than Mr Wonka's factory. Uplifting bergamot and sweet, wild orange oils help to tone and brighten, giving a sweet fruitiness to this most luxurious soak. Available for both men and women, these Burlington Easter Egg Gift boxes, come in a range of colours, making them an affordable Easter gift for those who love fashion - especially socks, or those who lose too many socks! Choose from either blue or green for men in sizes 6.5-11, and pink or purple for women in sizes 2.5-6.5. A delicious way to hop into spring ... a sweet treat of sugary coconut, creamy vanilla, and bright citrus. The traditional design of Yankee's signature classic jar candle reflects a warm, relaxed sense of style that's always at home. Convenient and easy to use, our large jar candle provides 110 to 150 hours of true fragrance enjoyment! If you know a hot drink fan, then look no further for the perfect Easter gift this year! This Dotty Tea For One set from Avon compromises of a half teapot and a mug for one! From afar, you'd be mistaken for thinking it's a regular teapot, however, upon closer inspection, you'll see where the products separate. Covered in gold metallic style hearts, it's my personal favourite this Easter! Coffee and chocolate have always gone hand-in-hand, but at CRU they're taking it to the next level. They've partnered with Lavolio, a fantastic London Confectioner who specialise in creating handmade, boutique sweets to bring you the perfect indulgent Mocha. Specially developed alongside their Intense blend, the cocoa powder help creates a perfect grounding for the mocha, whilst the the marshmallows, encased in belgian milk chocolate, bring a sweetness that sets off the entire cup. Set includes x2 packs of CRU Intense Coffee, x1 Tin of Lavolio Chocolate Marshmallows, x1 Tin of Lavolio Cocoa Powder, x1 Mocha Recipe Card - enough for six indulgent mochas! The perfect present for friends and family to create the the best parties ever! The kit transforms your computer or iPad into the ultimate karaoke machine, with instant access to thousands of songs including all the greatest hits and latest chart releases. Need a new way to keep friends and family entertained during the Easter period? Nothing beats a fun-filled singalong session with Lucky Voices professional singing equipment. Also available in Blue for £40! From the Jockey® USA Originals collection comes this women's button through lounge dress, it features a breast pocket with a visible red stripe, whilst the ribbon print itself is red, white and blue with a plaid pattern. It's made from 100% fine quality cotton, flannel and brushed materials, making it the perfect alternative Easter gift for those who love their lounge clothes. An easter gift without the calories! That's what we love about this Easter gift set from Yankee Candle. No more chocolate overdoses, just wonderful Easter fragrances to fill your home with the smells of Easter and spring! The set contains one Yankee Candle votive holder, along with three Yankee Candle votive candles - Jelly Beans, Vanilla Cupcake and Bunny Cake. This six egg boiler from SEVERIN is so simple to use and takes the guess work out of getting perfectly boiled eggs, whether you prefer soft, medium or hard! You can boil six eggs at a time, and you won't risk cracking any, or losing the egg white because isn't that annoying when that happens for no reason at all!? This will make the perfect home buy gift to make the most easy of Easter breakfasts! The quest for eternal youth is fuelling one of the biggest publishing trends to happen in decades. Adult Colouring Books are selling in the hundreds of thousands with books continuing to dominate every best-selling book list from Amazon to the New York Times. Crayola has launched a new range of Adult Colouring Books and stationery into the UK to coincide with this new creative trend offering adults therapeutic down-time to combat the stresses of daily life. Perfect for those who'd like to chill out and de-stress during the Easter holidays. You want an Easter Egg, but Christmas was only yesterday. I understand that an Easter Egg without the calories is what we're all looking for, and I'm pleased to announce I've found it! This adorable Easter Egg from Yankee Candle contains three gorgeously scented wax melts in lovely Easter scents. Inside the egg, you'll find a Summer Scoop Wax Tart, a Cappuccino Truffle Wax Tart, and a Jelly Bean Wax Tart. It's like a Kinder Egg for grown ups! This the perfect luxury floral gift for an Easter alternative this year! Fresh, locally sourced flowers posted straight through the letterbox in a purpose designed, 2ft ventilated flower box. It’s as easy as receiving a letter and they’ll be waiting on the recipients doormat when they get home! Florists lovingly pack your flowers in premium gift wrapping, including an A6 ‘A Little Note to Say’ greeting card with a hand written message, perfect for any occasion. Named after one of nature's best mothers, this stunning bouquet is the perfect spring gift and includes 100 freshly cut English Daffodils! 1 // Project Mc2 Dolls with Experiment // The Entertainer // £25 each. Now you can perform an experiment at home with the Project Mc2 Dolls with Camryn Coyl, Bryden Bandweth, Adrienne Atoms and McKeyla McAllister! Each doll has a different experience to do at home! Choose from McKeyla with her invisible ink pen, Adrienne with her perfume, Bryden with her light up bracelet, or Camryn with her wind-up pet robot! Parents can enjoy a well-deserved tea break whilst their children watch this brand new Twirlywoos DVD featuring eight episodes packed full of silly fun and surprises and Down, Over, Shorter and Shorter, Soft and Noisy. This Disney Cars puzzle will keep the kids entertained for hours over the Easter period! Suitable for ages 4+, and with only 63 pieces, it's a great non-chocolate Easter alternative gift, featuring the much loved Disney Cars characters! Just one of many character puzzles available from Aldi! Lamb's along with chicks and bunny rabbits are the three known animals to symbolise Easter! In past centuries it was considered a lucky omen to meet a lamb, especially at Easter time! This Schleich model is just one of hundreds of different animal models available to buy from the brand! It's small, but totally cute and will be the perfect non-chocolate Easter gift for animal loving children! This is a set of three baby rabbits with a hollow wooden log, we all know bunny rabbits are another Easter presented animal, but did you know rabbits are born with no fur!? Their beautiful, warm fur does not grow until they are in their burrow! Made from durable plastic and hand painted, this is another perfect gift for any animal mad children this Easter. Frozen came to our screens a few years ago, but is still a much loved Disney film! This gift is a truly special board for any drawing, erasing or starting again, so you'll child will never need to stop having fun! It comes with three geometrical stencils to enrich creativity. Suitable for ages 4+. The Little Live Pets Duck and Baby love to sing, speak and eat! Join the feathered mum and baby as they sing and play the day way! Put the pair next to each other and watch mother duck teach her duckling how to sing. The closer they are, the happier they become! As well as nurturing her duckling, mother duck will record your voice and sing it back to you. Listen as the two ducks communicate with each other with over 55 songs and baby bird calls! 10 // Mr & Mrs Potato Head // ASDA // £5 each. Playskool's Mr & Mrs potato head have had a bake over! Mr. & Mrs. Potato head both have a new look and they've sprouted legs! With slimmer bodies and new legs they are ready for any and all active adventures! Just two brilliant toys from Asda's £5 toy range this Easter! From counting and cooking to serving and sharing, it's preschool prep for little chefs with 16 fun ingredients included: • Interactive oven • 4 Pizza slices • 3 Pieces of bread • 2 Cupcakes • 1 Fried egg • 1 Skillet • 1 Spatula • 1 Baking tray • 2 Plates. Delightful singing oven warms up counting, sharing and vocabulary skills. Press the chef's hat for learning songs, or listen and learn along to fun phrases. Fry an egg in the pan, bake some bread, a pizza and cupcakes, and serve food onto plates with the spatula! 1 // Bratz Sweet Style Dolls // The Entertainer // £20 each. The Bratz Sweet Style Collection features each of the four Bratz girls in outfits inspired by their favorite sweets! With Jade, Cloe, Sasha and Yasmin to choose from, each coming with different accessories, one of these would be the perfect alternative Easter gift for any Bratz fans out there! 2 // Rabbits and Ducks Hair Brushes // Rock & Ruddle // £20 each. Rock & Ruddle have created a gorgeous range of high quality, luxury hair brushes in some simply stunning designs including the chick and rabbit! Rock & Ruddle’s quality boar bristles are strong and resilient, have a natural stiffness that means that they brush the hair thoroughly and yet don’t pull as they are drawn through it. They have microscopic scales that release and drag the sebum (natural oil) that is produced in the scalp distributing it along the hair making it shiny and healthy looking. Perfect for de-tangling and taming unruly hair. The egg hunt is open! A lot of activities in one giant Disney Frozen egg. A great gift for easter well actually anytime of the year! The recipient of this wonderful Disney Frozen gift will find the most creative egg they could possibly imagine. This Disney Frozen egg shell can be split apart, and inside you will discover all manner of amazing creative materials to amuse and entertain. It includes 24 creative accessories and two drawers for art supplies! Cute little Chickedy from the Twirlywoos loves to talk and talk! Press its tummy to hear sounds straight from the Cbeebies show. Chickedy's also made of super-soft material that little ones will love to hug. Twirlywoos is the new TV show from the same people who made Teletubbies and In the Night Garden. Follow these curious characters and their adventures on CBeebies now! A great Easter gift for ages 10 months and up! This Little Baby Born Doll loves to hold your hands! She's a super-soft and cuddly friend with a very special gift. Squeeze her hands and she will sing songs for you. You can even join hands with a friends and your Baby Born doll for a big sing-along. This Baby Born doll just loves to be the centre of attention. A great doll for ages 0+. This exciting catch-the-bunny Game from University Games is the perfect Easter game to play this year! Catch the bunny to help you win the game! The cute Bunny sits guarding his carrots, safely sitting on top of his burrow. Spin the spinner to see how many carrots to pull from the field and place them in your basket. But watch out! One of the carrots will make bunny jump into the air. Can you catch the bunny to get an additional 2 carrots and help you win the game. 1 // Lalaloopsy Minis Style 'n' Swap Doll // The Entertainer // £10 each. These Style 'n' Swap dolls from Lalaloopsy comes with different wigs, fashionable outfits and shoes! Customise their looks for endless ways to mix and match! Choose from Crumbs Sugar Cookie, Peanut Big Top, Mittens Fluff 'n' Stuff or Spot Splatter Splash! 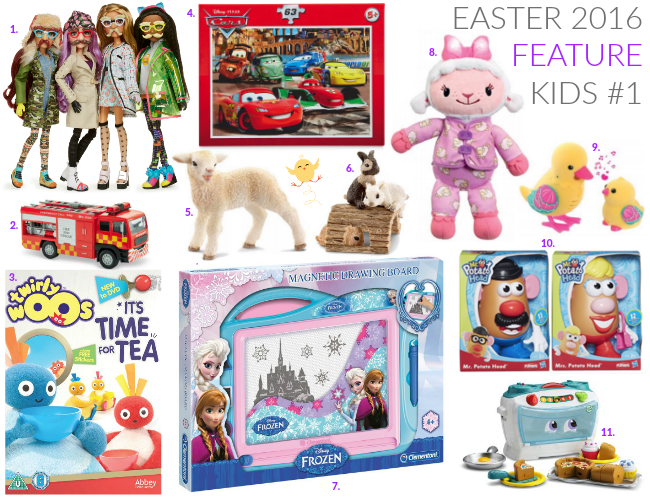 They'll make the perfect Easter gift for Lalaloopsy fans aged 4+. A pirate-themed sticker book with over 1000 stickers to play with is sure to be appreciated by any pirate fan this Easter season! Perfect for creative kids, with at least 1000 stickers to use in the book, or within other arts and crafts areas, it will be sure to keep the recipient entertained for hours! Bop and pop for prizes in this unpredictable Pop! Pop! Pinata! Game. Ready to make a dash for prizes? They may pop out any time you hit the party button. Whoever gathers the most prizes in the end is the piñata-poppping winner! A great game for 2-4 players and ages 4+. Includes Pinata, 2 x ears, Tail Base, 4 x cups, 36 x assorted plastic prizes and instructions! No party is complete without a pinata, so make this your Easter pinata buy this year! With the exciting release of Batman vs Superman, Aldi have things sorted with their great range of character t-shirts! This short sleeved t-shirt features the official Batman logo, is made from 100% cotton, is soft, comfy and durable whilst being washing, drying and ironing safe! Sold in sizes 2-10 years. Little ones will love cuddling up to My First Baby Annabell's Brother Doll. He's the perfect doll for younger children and has a soft body for lots of hugs. This 36cm doll also has a beautifully designed outfit and a bottle for feeding. With an adorable face and brown eyes, My Baby Annabell's brother just loves to be loved! A great gift for ages 12 months and up. Enjoy seasonal fun in the kitchen with this super LEGO® Painting Easter Eggs set. Build the detailed kitchen scene and pretend to paint the Easter eggs using the paintbrush and palette. Don’t worry if you drop an egg— the hen in the garden has just laid another one! Includes male and female minifigures with assorted accessories! Features a buildable kitchen scene, small garden build with a hen plus an egg and flower elements! Accessory elements include a paintbrush and a palette. A perfect Easter gift for LEGO® lovers! With the exciting release of Batman vs Superman, Aldi have things sorted with their great range of character t-shirts! This short sleeved t-shirt features the official Superman logo, is made from 100% cotton, is soft, comfy and durable whilst being washing, drying and ironing safe! Sold in sizes 2-10 years. This House of Paws Woodland Vinyl Hare Ball is a fun bright squeaky toy for your pooch to play with this Easter period! We can't leave our pets out can we? 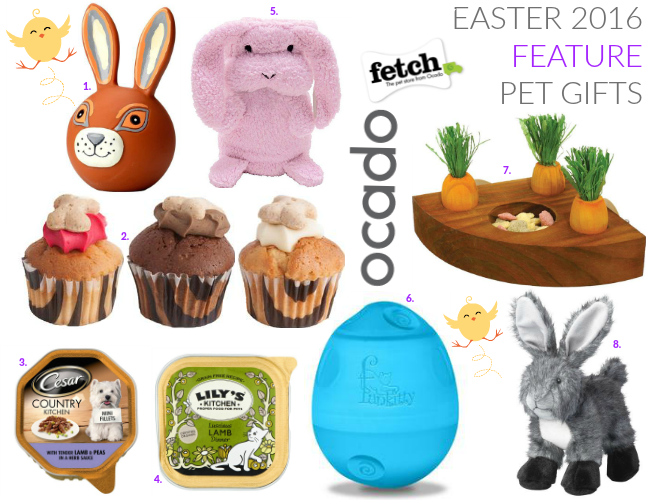 So luckily for us Fetch - the pet store from Ocado, has all our pets covered! The Barking Bakery provides pawlickingly dogglicious treats for your pooch, handmade in their bespoke 'Pet Petisserie' right here in the UK. These Mini Iced Woofins consist of three low fat bite sized light and fluffy sponge cakes, decorated with creamy yoghurt topping and finished with a doggy bone. The Woofins come in mixed carob and vanilla flavours and are the perfect way to spoil your furry friend this Easter! Conveniently packaged in cute bone themed clear plastic travel pods which keep them safe and fresh until treat time! With many of us celebrating Easter with a roast lamb dinner, it's not fair for our furry pet family members to miss out! Luckily Fetch has a great range of lamb dishes just for pets! This is just one brand of many sold for dogs, and it's what Jezeppi will be tucking into on Easter Sunday, its lamb strips with garden vegetables in gravy, so he's only missing out on the yorkshire puddings! 4 // Lily's Kitchen Organic Luscious Lamb Dinner // Fetch // £1. Just like with the dogs in our family, why should the cats in our family miss out too? This Lily's Kitchen Organic Luscious Lamb Dinner for cats will be the perfect dinner to give any feline companions this Easter Sunday! This very nutritious complete organic lamb recipe is grain free (cats are not designed to eat grains), and is made with a high organic fresh meat content that cats do really well on! This Hunter puppy blanket is great quality and environmentally-friendly, almost all of our products are machine-washable and therefore easy to care for. Creativity is especially shown in the area of Hunter's own modern designs. The Funkitty Egg-Cersizer is a treat/feeding ball that randomly dispenses treats & dry food. It is uniquely adjustable to your cat's level of play. Open 1, 2 or 3 holes to customise to your cat's needs and increase the challenge over time. The Treat Meterrandomly pops out treats from all angles. Have a chubby feline? Feed your cat each meal in the Egg-Cersizer for more exercise and portion control in one fun package. Woodland friends plush rabbit dog toy is the perfect gift for dogs this Easter! It's a lovely soft rabbit with a squeaker, the toy does contain plastic squeakers, but it'll be worth the fun this Easter to see your dog entertained! Collect yummy eggs in this fab felt friend. This Chick-shaped basket is the perfect way to carry around all your Easter goodies during an egg hunt inside or outside! 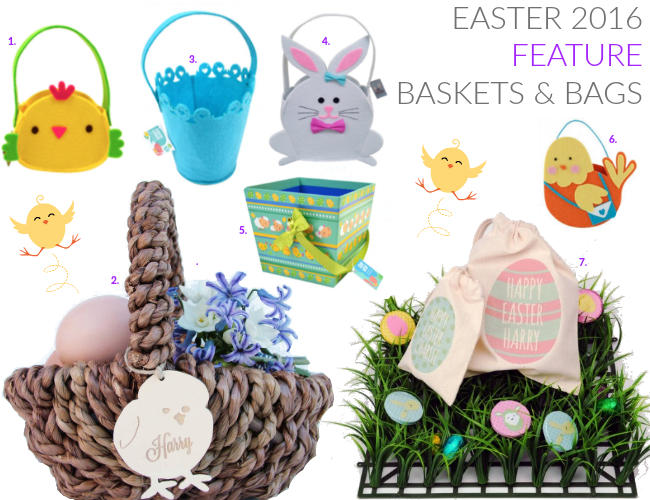 A beautiful addition to the important egg hunt, a natural woven basket trimmed with cute wooden chick or bunny engraved with your child's name. A fantastic present or a lovely addition to the Easter egg hunt that can be treasured and used year after year. A sturdy little child's basket in a natural weave with a pretty little wooden chick or bunny trim, engraved with a child's name or a short message. Choose from a friendly wooden chick or bunny trim in a range of sweet spring colours, add your child's name or a short message. Collect yummy eggs in this fab felt friend. This blue bucket shaped basket is the perfect way to carry around all your Easter goodies during an egg hunt inside or outside! Collect yummy eggs in this fab felt friend. This bunny-shaped basket is the perfect way to carry around all your Easter goodies during an egg hunt inside or outside! This sturdy card loot basket with ribbon handles is the perfect basket to collection small Easter hunt items in! We use ours to collect the Easter hunt clue cards, so we don't get confused with what clues we've done! Tesco’s adorable felt Easter bunny, sheep and chick bags make the perfect presents for kids of all ages. Great for helping the kids collect their Easter egg hunt treats. They're sure to put a smile on children's faces. Add a personal touch to Easter this year with these very cute, bespoke treat bags, perfect for gifts and egg hunts. Made from 100% cotton, these draw string bags are also a lovely little keepsake long after the fun of the special day. Available in a range of different colours, patterns and messages. If you're looking for even more Easter/spring time party ideas, than do check out the Postbox Party website! Who is the Easter Bunny, and what’s his story? This eggstra-special book reveals all... Featuring your little one’s name on every page and across 10 beautiful illustrations, ‘The Easter Bunny Story’ is a charmingly designed rhyming book starring your child. Everyone knows the Easter Bunny comes every year with a basket full of brightly-coloured eggs. But where do Easter eggs come from? How does he deliver them all and what does the Easter Bunny look like? At last, the Easter Bunny’s secrets are revealed in this delightful tale, perfect for springtime. Not only that, but the Easter Bunny has hidden 12 Easter eggs throughout the book. Can your child find all of them? 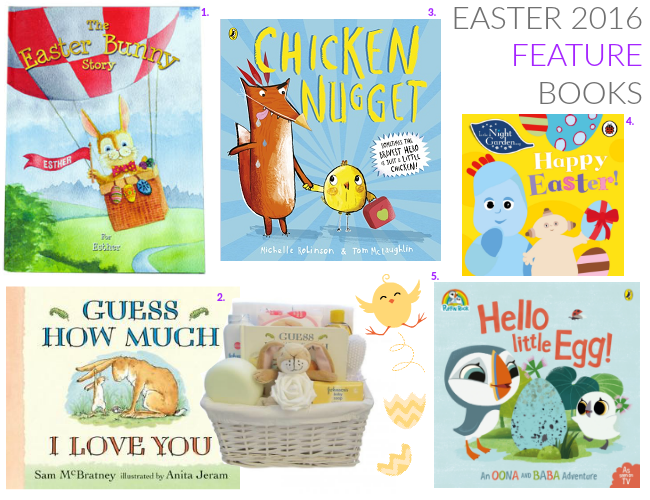 This is the ideal Easter gift for a newborn baby, this baby hamper contains a Guess How Much I Love You bunny comforter and story book along with baby bath products, making this a perfect gift for a first, second or subsequent baby. It comes presented in a white wicker basket which can then be used in the nursery to store baby essentials. Contents 1 x White Wicker Basket, 1 x Guess How Much I Love You Comforter 1 x Guess How Much I Love You Story Book 2 x White Muslins 1 x Johnsons Baby Shampoo 1 x Johnsons Baby Powder 1 x Johnsons Baby Wipes 1 x Johnsons Baby Soap 1 x Sponge 1 x Brush & Comb. It's Easter in the Night Garden! But Igglepiggle has lost his special Easter egg. Can he find it with the help of his friends? Join all of the Night Garden characters in this gorgeous board book, with a sweet Easter-themed story. With gorgeous illustrations, this chunky board storybook will captivate little ones, and is the perfect story to read at bedtime. Welcome to Puffin Rock - home to two young and fun puffins, Oona and Baba. Join this delightful pair as they discover their island and embark on new and exciting adventures! During playtime, the two puffins find an egg all its own, and endure a race against time to reunite the lost little one with his worried family! With beautiful and nostalgic illustrations reminiscent of the award winning preschool animation series, these characters are set to become firm family favourites in both book and TV format! 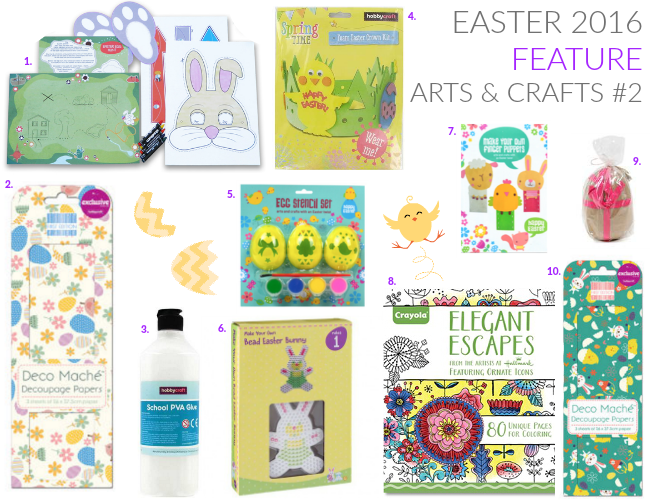 With the Easter holidays approaching, now is a good time to stock up on your Easter crafts and Asda have a great range to help us all out! One of those items is this trio Easter tape roll! Use it with your children on their Easter arts and crafts makes, or wrap up Easter presents with a unique Easter tape! Make Your Own Pompom Easter Characters with a collection that’s oh-so-fluffy! Start off the springtime crafts with oodles of googly eyes, foamy feet and fuzzy pompoms to create your very own Easter chicks and bunnies! Pick up your glue and start putting this colourful bundle together, prop these chicks atop of bonnets! Why not try Poundland's new Easter egg character craft kit for a fab steal of just one pound!? 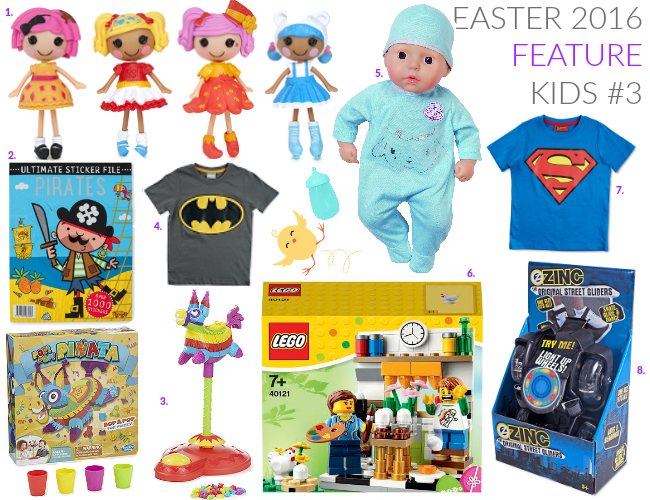 This is a great way to keep the little ones entertained over the Easter break! Kit contains pre cut foam shapes, sequins, wobbly eyes, paint, paint brush & instructions and gives your children the chance to make three eggs, and the three animals associated with Easter, a chick, bunny and lamb! 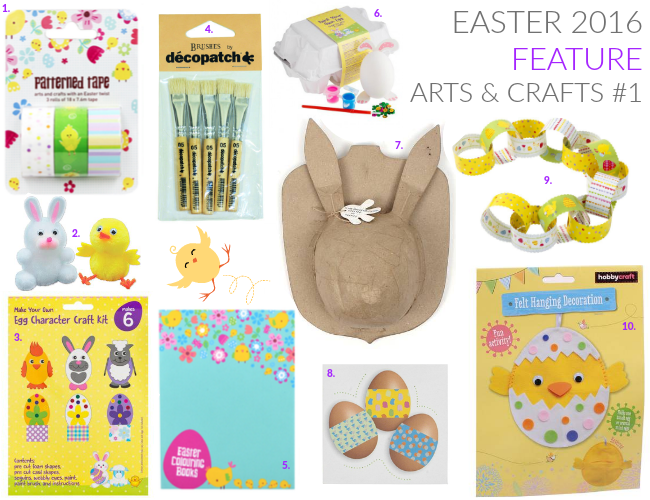 Get stuck into Decopatch and Easter crafts with these fantastic No 5 Brushes. This pack of five brushes may look rough, but surprise yourself as you dab across a thick layer of varnishes and adhesives to create and perfect your crafting Easter masterpieces. Ideally used with decopatch papers, bring out the shape and contours of mundane objects with an easy-to-do process. Grab and dab – it couldn’t be simpler! This Easter themed colouring book is a perfect buy to keep children entertained before and after the Easter bunny has left his eggs this Easter! Filled with pages of uncoloured images, let your children go wild with their pencils and take some time away from all the chocolate! If your child didn't get the chance to decorate a real egg this Easter season, then why not purchase them this set so they can get in on the action? This set comes in an egg style box making the craft session seem even more realistic ad contains a ceramic egg, paints, a paintbrush and accessories to decorate! The Decopatch Mache Jack Rabbit Trophy is a great Easter essential! Create your own home decorations with a funky craft surface that can be painted and glued with all kinds of decopatch designs. This shape contains a useful hanging hook on the back to help you pop it onto your door or wall once completed! A great project to work on with the kids, the craft surface is ideal for poster and acrylic paints. Just use a sponge or a brush to apply up to three coats of paint. To decopatch, simply tear up your decopatch papers into manageable pieces, then use glues to gently sponge across the surface of your shape! This set of 12 Easter egg magic wraps in 6 designs are an easy way to quickly make beautiful Easter eggs if your child isn't the biggest of arts and crafts fans! Simply wrap one of the designs around an egg and you're done! It's that easy! You can find HEMA stores in Birmingham, Bromley, Kingston, London Stansted Airport and London Victoria, alternatively, check out their online store for hundreds of lines at affordable prices! 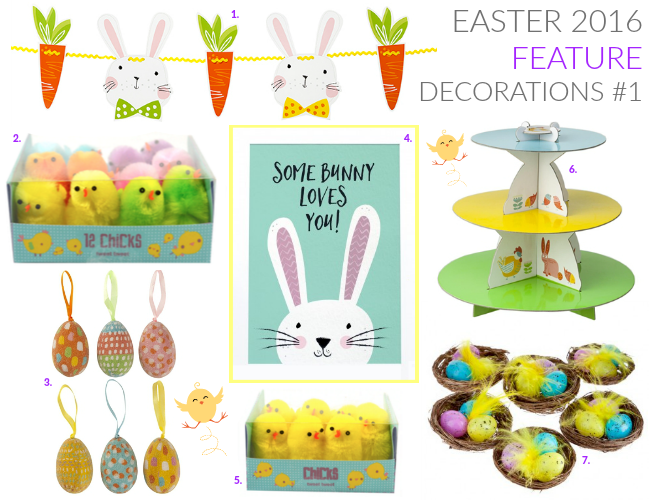 Create your own fantastic Easter decorations with the whole family this year with Talking Tables festive Easter bunny and chick paper chains. Our paper chains come in four different reversible designs, and each pack contains 100 paper chain links, stretching to 10 metres! Simply clip together and deck your garden for an Easter egg hunt for the kids, or drape somewhere inside as decoration for the Easter feast, they're also perfect for all sorts of Easter arts and crafts! Build a Easter Felt Hanging Decoration and pop in a few pocket-sized surprises! 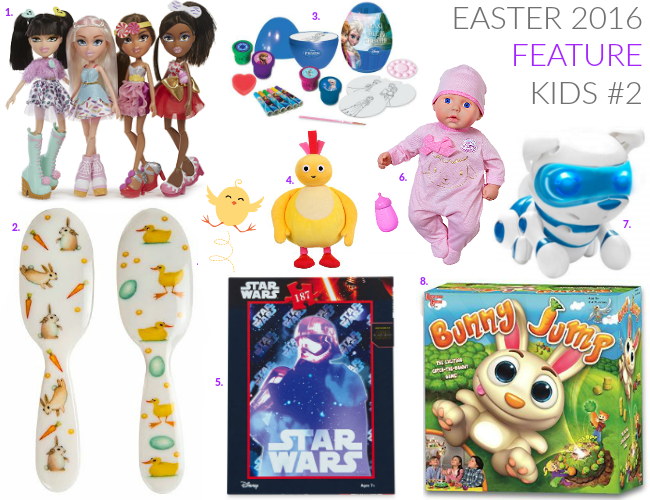 This eclectic mix is a fun activity for you and the kids, where you can put together a springtime chick who is ready to pop out of his egg! Just by using a dab of glue and the plastic needle included, this hanging decoration is a great way to get stuck into crafting and sewing! On the back of the felt shape, there’s a pocket where you can pop in a variety of eggs and treats! Don’t forget the beak and the googly eyes! This Easter Activity Pack will make your Easter egg hunt a fun and EGG-citing experience! Hide the treats and then draw a route on the illustrated map provided for your child to follow. Before the egg hunt, children can colour in and make some fun masks to wear and baskets to carry their goodies in! Included in the pack are clue cards, direction arrows and bunny foot prints that can be used to help your child follow the route on the map and find all the goodies! This is one activity pack that is great for entertaining the kids at Easter! Surround your items of choice with a set of gilt, colour and more with this gorgeous Deco Mache Paper from First Edition! Get into the springtime spirit and indulge in the bright and beautiful world of decoupage art, where wrapping meets glue to create amazing ornaments out of the most mundane of items. Simply grab your selection of papers and start sticking, sealing and recreating! Put some spring style into your creations and bring your imagination out to play! This lovely squeezy bottle of PVA glue contains hours of crafting joy for all which you'll need for all the Easter arts and crafts you can be getting up to! Sticks paper, card, craft foam, balsa wood and other porous surfaces such as fabric. It's a crafting essential for all ages! School PVA glue has a higher initial tack and greater bond strength than standard washable PVA. It has so many uses besides sticking things together: use as a glaze on craft projects, or mix with powder paint to create a rich, vibrant paint. Here's a crafty activity to keep the kids entertained, Make Your Own Foam Easter Chick Crown Kit will certainly amuse the little ones during the Easter holidays. Including a foam crown shape, Easter chick and egg decorations, this kit will make for a fun-filled creative task that will ensure everybody is in spirit of the occasion! Your little one can stick all of the pieces onto the crown following the step by step instructions to create a marvellous chick hat! Gather all the family for an Easter egg- travaganza craft activity that will make for an unforgettable Easter! With this egg stencil kit from Asda, your children can transform hard boiled eggs into artistic hard boiled eggs! The kit includes three plastic egg covers in three designs (a chick, ribbon and flower - with other basic shapes such as stars, triangles and circles), a paintbrush and four mini pots of paint (pink, yellow, blue and green). New for 2016, this Easter bead set is the perfect Easter crafty purchase for any children who like working with beads! The set comes complete with a bunny board and beads! Let your children get creative with this Easter finger puppet set from Asda! The children can make a chick, bunny and lamb - the three animals associated with Easter, with ease thanks to the packs easy to use contents! The set comes with a plastic needle making it a safe make for children! The Easter Mache Decoration is a fab way to start off the springtime crafts! Using tissue paper, pompoms, ribbons, decoupage paper and more, create a personalised Easter ornament, just in time for the egg hunt! The rough and absorbent mache texture allows you to apply a variety of adhesives and paints across the surfaces, such as Mod Podge and acrylic paints – you can even use glitter paint! Transform your Easter crafts with the Decopatch Paper featuring some fab Cracked Easter Eggs! Decopatch is the newest kid on the block, taking the traditions of Decoupage and breaking new ground with vivid colours, exotic patterns and fabulous, modern designs! Thin, strong, flexible and beautiful, once these patterns are down, you’ll never want to take them off! Tear, twist, cut, shape and embellish - these papers are great for a fresh start, without having to throw anything away! Bright and fun, and lots to go round! This Easter bunting is an egg-cellent addition to your Easter fun, featuring 5m of paper bunting in two fantastically Easter themed designs, Talking Tables happy bunny and his favourite vegetable is an essential party decoration this year. Perfect for hanging at the start of an Easter egg hunt, or simply to decorate your home, this garland is the perfect finishing touch, sure to bring smiles to everyone’s faces! With chicks being a large part of Easter symbolism, it'll be a great surprise for children to see an array of colourful chicks during their hunt this year! This pack contains 12 chicks in the following colours, x2 yellow, x2 green, x2 orange, x2 pink, x2 purple and x2 blue. This set of six Easter eggs comes with a cord to hang them up with. With Easter print and glitter effect, they're a fun decoration for your Easter tree branch or Easter table, or simply to use for decoration during the chocolate egg hunt! I love, love, LOVE this Easter print from Mrs Best, it's the perfect print to set Easter this year, and once framed and looked after, I'm hoping it will last a lifetime! Use it as the centrepiece for your Easter celebrations, or alternatively, this Easter print also makes a lovely thoughtful Easter gift for a loved one, especially if they’re trying to have a chocolate free Easter! The same as number two, only this time you get eight larger yellow chicks! Perfect for Easter crafting, gifting and hunting! This cardboard cake stand from HEMA is one that you easily assemble yourself. It consists of three different layers filled with images of spring, with three different coloured boards! Simply assemble and show off your delicious homemade, or shop purchased Easter themed cake! These cute miniature Easter nests complete with three mini eggs and yellow chick flowers are perfect to decorate the Easter table with! Alternatively use them to decorate your Easter bonnet or other Easter craft sessions, or use them as part of your egg hunt! We may be spoilt for choice when it comes to Easter chicks, but these chicks from HEMA are my all time favourite! They have clips on making them much more easier to use as props unlike other chicks! Decorate Easter bonnets, hampers, baskets or hunt areas with these easy to use chicks on a clip! 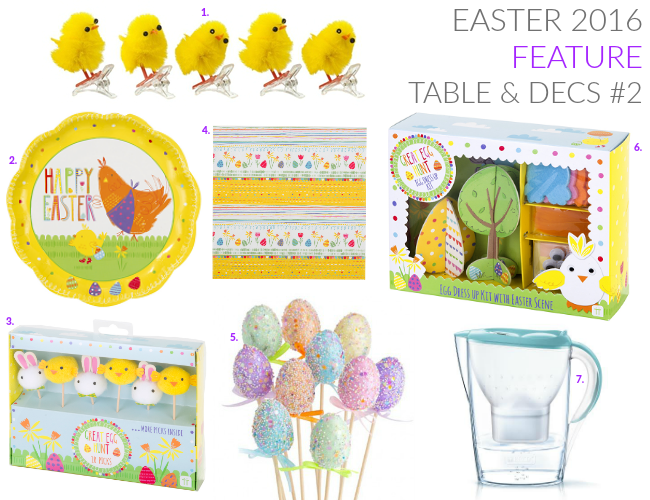 An absolute Easter essential, Talking Tables Great Egg Hunt Easter plates are the best place to pop all your tasty treats on after the Easter egg trail. These delightful chick and hen paper plates come in packs of 12 and feature a dotted egg design as well as wishing you a happy Easter! Make sure to match your plates with The Great Egg Hunt Easter napkins and guarantee clean hands instead of those sticky little fingers! These quirky pom pom picks will add the finishing touches to your Easter party food. Decorate your centrepiece cake, hot cross buns and cupcakes, or even pop in the grass and flower pots to decorate your Easter Egg Hunt. Each pack contains 10 pom pom picks - five cute chicks and five rabbits, a fun decorative touch to your Easter celebration! In a beautiful Easter setting, these paper napkins add a fresh spring style to your Easter table decoration. Whether you’re planning an Easter egg hunt or family feast, these colourful napkins are a match made in heaven for those mucky hands and chocolate covered mouths! The vibrant floral napkins come in packs of 20 and match with Talking Tables paper plates to bring your Easter celebration to life. Our 10 pack Easter egg stakes are perfect for those of us who love being creative over Easter! Pop them in the grass, lay them on the table, or place them in a vase for the perfect alternative bunch to flowers! For just £1 for 10, they work out at an affordable 10p each, so why not even pop them in party bags for adults to take home!? The list of ideas is endless! Easter activities are more creative than ever these days. Build your very own Easter scene and disguise your eggs with Talking Tables adorable egg decorating kit. Perfect for the little ones, disguise each egg like the Easter Bunny or a feathered chick and place in the fold out Easter scene. Talking Tables eggs-traordinary kit includes enough stickers, googly eyes, feathers and felt feet to decorate up to 6 hard-boiled eggs perfect for any Easter Party and to use as decorations! BRITA have just released their brand new pastel Marella jugs, perfect for drinks this Easter! Marella Jugs hold up to 2.4 L, fitting perfectly into the fridge door and has a helpful 'memo' which reminds you to change the filter to ensure you always have the freshest filtered water. The Marella jug reduces levels of chlorine, heavy metals and limescale in your water, and also features a sleek flip top lid. Having this on hand as part of your table decorations will go down well with the whole family after a hard looking egg hunt!